As if you thought you had enough to think about, you need to think about food for your guests. Perhaps you won’t be hungry as sometimes nerves get the best of the bride and groom. Remember that some of your guests have traveled a distance to join in the festivities. You want to make sure they are happy and well fed. The food and beverages are so important that they set the entire affair. It may seem like a large amount but some say that about fifty percent of your budget will be used on the catering and menu You will more then likely have a culturally diverse crowd at your reception. Therefore, you want to make sure that the food present makes all of their tastebuds happy. Perhaps you are having difficulty deciding what flavors of food to have or what culture to choose to set the whole theme. Some brides and grooms like to celebrate both cultures by somehow combining the two. One culture can dominate the wedding while the other dominates the reception. Consider combining the two cultures with their traditional foods by splitting the ceremony and the reception half and half. This way all friends and family should be happy that you are remembering their heritage. This will surely make your new family happy and proud to have you as an in-law. Food contributes to the ambiance of the wedding. Make sure you consider all your options. Do you want a seated meal, buffet styled or passed trays? What does your budget allow? How many people will be attending? Usually costs are figured per person. In some instances, you may pay for the type of food along with the way it’s presented. 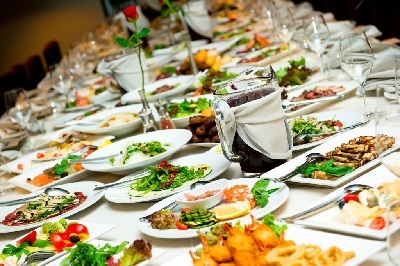 For instance, buffet style may be different from an elegant sit down dinner or appetizers and cocktails. Consider allergies of any friends or family members. The idea is quality of food, not quantity. As you consider your options and visit various halls, remember to ask many questions. You will eventually need to know who will provide items such as the table settings or if the caterer will have servers for the cake. Some provide the table linens and decorations. Others do not. Of course, always consider your various options, ask tons of questions and carefully read the contract. Make sure you feel confident the caterer you choose will give you what you want and need to make the rest of the day perfect for you and your guests.